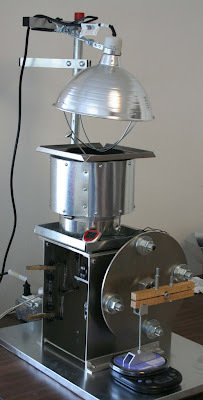 Stirling Engine setup for measuring power output. The postal scale measures torque generated by the friction of the arm clamped to a sleeve on the crankshaft. The tachometer (small red device) displays RPM. A thermometer displays the temperature of the water heated by the heat lamp. I use an infrared thermometer to measure the cold sink below the displacer. Partly visible at the lower left and held on with clothespins is a manifold for measuring peak positive and negative pressures with a manometer. The pressure tap is routed through one of two one-way valves and then to the manometer. This arrangement allows the manometer to track peak pressures at higher RPM than is possible by direct connection to he manometer.